Continuing in my series of twice baked potato lunches, here is a football themed meal. I served this to my 16 year old nephew for lunch at home. It was his idea to make the goal post and field out of bell peppers. I love collaborating with my nephew. I think that it turned out great. This entry was posted in Bento / Cute Food, Food and tagged bento, lunch, sports, twice baked potato, vegetarian. Bookmark the permalink. This is so creative and cute, I LOVE it! LOL! I made a butterfly cookie cake for Natalie’s birthday and the leftovers made a football…so I took the football into work today. And you have a whole football lunch. How cool is that? Adorable! What a great idea for a football or Superbowl party! I love twice-baked potatoes. TAn artful eye runs in your family. 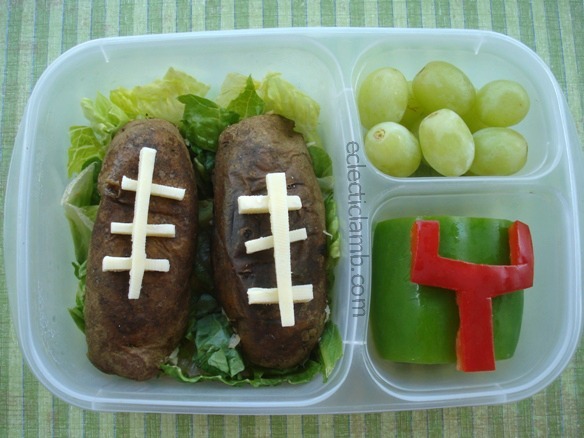 Love how you made the footballs out of twice baked potatoes! Looks amazing! i’m a HUGE football fan(i like the steelers) so i especially like this lunch! P.S. what football team do you like? Thank you! I am not a football fan but my nephews are. We live in Western NY state so they are Bills fans. What team do you like? Oh that is so cool! Very clever and “doable” Nice Job. LOVE it! My kids would love this, too. We are big baked potato fans! Thank you so much Sarah! I enjoy working with my nieces and nephews to create healthy and fun meals for them. Love the potato footballs! What fun!